When you're finally ready to do your scuba certificaton course, the PADI Scuba Diver course is the first level. It takes 2 days for you to master the skills required to dive to a depth of 12 metres/40 feet. For this PADI Scuba Diver course in Bali, you'll learn how to use the equipment, and will be instructed by a private instructor in pool sessions. On the second day, you'll head out for your open water dives, accompanied by your instructor and the rest of the crew. NOTE: You will be expected to swim 200 metres and float for 10 minutes in open water for this PADI Scuba Diver course. For your two open water dives, you can opt to dive in Padang Bai or Tulamben. Padang Bai is the most sought after dive site in Bali and is rich with colourful fish, soft and hard corals and lots of dive spots. These clear and low current waters are perfect for new divers and offer lots to explore underwater. As for Tulamben, it is no secret that it has one of the best wreck dive sites in the world. The USS Liberty shipwreck lies on a sand slope of 9 to 30 meters underwater. The dive site of Seraya Secret is unmatched for its 10 meter-deep black sand bottom which is home to many exotic creatures. The dive sites of Kubu and Coral Island are prided with colourful soft and hard corals. • Get licensed to dive anywhere in the world with the PADI Scuba Diver (SD) certification. • Explore the rich marinelife and swim with schools of fish and corals. • Undertake 2 open water divesin the blue waters of Bali. • Dive up to 12 metres deep under the supervision of an experienced instructor. You must respect the natural habitat during the scuba course in Bali. The operator will provide the equipment for the Bali diving trip. You are responsible for the equipment and must use it with care. Participants are strictly prohibited from carrying weapons, illegal drugs alcoholic beverages or other hazardous substances. If cancellation is made 7 days or more before the departure of the PADI Scuba Diver Course in Bali: Full refund, minus any transaction charges. If cancellation is made between 0-7 days before the departure of thePADI Scuba Diver Course in Bali: No refund. Refund will be done as per the exchange rate of the current date. The operator reserves the right to cancel, alter or reschedule the itinerary of the scuba course in Bali due to unforseen circumstances such as earthquake, tsunami, flood, storm, hurricane or any other natural disaster, war, political unrest and other hostilities that declare it unsafe, harmful or impracticable for the participants or staff. Participants are responsible for their own belongings and the operator will not be responsible for any loss or damage during the scuba course in Bali. The operator is not responsible for any injury, accident or death during the Bali diving or sea transfers. Participants will have to sign an indemnity form before starting the scuba course in Bali. You'll be picked up from your hotel. You'll be dropped off from your hotel. Eat a good breakfast before your pick up arrives at 07:00 hrs. Reach the dive centre by 07:40 hrs and after some paper work, you'll start your course. The first half of the day is spent on understanding the basics of scuba diving with a 2-3 hrs theory session. After lunch, you'll try all your new skills during the pool session. This is another 2-3 hrs session and helps you test the equipment in water and makes you more comfortable. You should be done by 17:00 hrs and the rest of the evening is at leisure. Day 2 of PADI Scuba Diver course in Bali: Dive day! Eat a healthy breakfast before your pick up arrives at 07:00 hrs. Reach the dive centre by 07:40 hrs and you'll prep for your first dives. Once you're set, board a mini bus or car and you'll be driven to either Padang Bai or Tulamben. Undertake your first two dives and you'll have to complete certain skills and tasks underwater to earn your license. You'll have lots of time to discover the rich marinelife at these sites. There is a light lunch, snacks, water and soft drinks on the boat to enjoy in between dives. Return to the dive centre by 16:00 hrs and collect your scuba license. Your trip ends here. Personal expenses such as extra meals, telephone calls, tips, cigarettes, etc. There is no accommodation in this package. 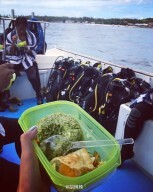 | You will be provided with a light lunch, snacks and soft drinks between dives. There is also plenty of purified drinking water on the boat. You'll be picked up from your hotel in Sanur, Kuta or Semniyak for the scuba course in Bali. If you're not staying at any of the pick up locations, you'll have to make your own arrangements to the dive centre or the operator can arrange your transfers at an additional cost. Your operator will arrange your transport to the start point of the scuba course in Bali.